We at BarkPost want to send our heartfelt gratitude to everyone who has played a role in earning and preserving the freedom of our great nation. Dogs in the military struggled to earn their recognition as American heroes, and now that they have we’d like to pay tribute by sharing some facts you may not know about these hard working canines. 1. Dogs have been in combat with US soldiers during every major conflict, but they were not officially recognized until WWII. Sergeant Stubby of the 102nd Infantry, Yankee Division went from mascot to hero during WWI after being smuggled into battle by Private J. Robert Conway. Stubby went on to detect enemy gas, bark out warnings when rival troops were near and locate the wounded on the battlefield. By the start of WWII, the military had recognized the value canine soldiers could bring and began using them primarily for recon. Stubby forged the way for all canine soldiers who followed and remains a symbol of military bravery and heroism to this day. 2. They are trained in bomb, weapon and drug detection, tracking, and to attack the enemy. Lackland Air Force Base in San Antonio, TX has been training sentry dogs since 1958. K9history.com details the manpower and dogpower that goes into training the amazing pups of the Department of Defense Military Working Dogs Training School (DoD MWD) at Lackland. Today, more than 1,000 dogs are trained at any given time by a staff of 125 from all branches of military service. The complex training techniques are designed to utilize the dogs’ natural gifts for focus and aggression to their advantage. German Shepherds and Labradors can detect weapons, bombs, gases and drugs more accurately than any available military equipment. 3. There are about 2500 dogs in active service today and about 700 deployed overseas. 4. 85% of military working dogs are purchased from Germany and the Netherlands. The 2013 article “Canines in Combat” from San Antonio Magazine notes that the bloodlines of these dogs go back hundreds of years, making these pups literally “born for the job.” The Air Force Security Center, Army Veterinary Corps, and the 341st Training Squadron are combining their efforts here in the States to breed suitable dogs for military service. Currently the other 15% of working dogs are USA born and bred, and the military hopes to increase this number. 5. They are extremely valuable, and not just for their service. According to retired Air Force K9 Handler, Louis Robinson, a fully trained bomb detection dog is likely worth over $150,000. But really, these animals are priceless. With an average of 98% accuracy in their detection skills, the peace of mind they provide to the troops is immeasurable. Robinson resides in Phoenix, AZ and runs Robinson Dog Training. He’s using the extensive skills he learned as a Military Police K9 handler to help civilian dogs learn basic obedience, search and rescue, therapy skills and advanced protection training. 6. Only about 50% make it through training. Military working dogs are not just chosen for their breeding or the keenness of their sense of smell, they must possess several other qualities. They must be free of physical issues like hip dysplasia and be highly reward motivated. Trainers at Lackland use mostly toys like Kongs that can be hidden to represent bombs, but treats are also utilized. Suitable dogs for military service must also be able to attack on command. Pups have actually been dropped from the program due to extreme stress at having to bite a human. 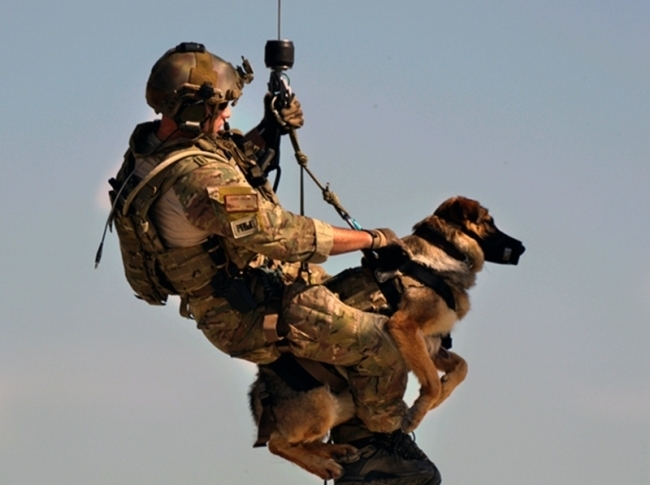 Military dogs must have just the right level of aggression and excitability. 7. They aren’t all German Shepherds. When we think about military dogs, muscular German Shepherds tend to come to mind. But several different breeds have shown patriotic heroism over the years. Many branches use the highly trainable Labrador Retriever. The elite US Navy SEALS use the Belgian Malinois, a breed similar to the German Shepherd, but smaller. These dogs are incredibly compact and fast with a sense of smell 40 times greater than that of a human. Their small stature make them ideal for parachuting and repelling missions with their handlers. The SEALS were accompanied by a Belgian Malinois named Cairo during their raid on Osama Bin Laden in 2013. 8. They can get PTSD. Just like their human brothers and sisters in arms, pup soldiers are susceptible to the horrors of PTSD. War dogs experience severe emotional trauma during deployment, and for some it becomes too much. Gunner, a Marine bomb sniffing dog became so skittish and unpredictable during active duty that he was declared “surplus” by the military and released from service. Gunner was adopted by the family of Corporal Jason Dunham who was killed near the Syrian border in 2004. He and the Dunhams are working on healing together. 9. They mourn the loss of their handler and vice versa. In Rebecca Frankel’s book, War Dogs she explores the remarkable bond that develops between service dog and handler. One such pair was Marine Lance Corporal Joshua Ashley and “Sirius”. They were the number one team during training at Yuma military base, but tragically Josh was killed by an IED just two months after deploying to Afghanistan. “Sirius” at first refused to take commands from his new handler and showed significant signs of agitation at the loss of his partner. Such stories are all too common among canine and handler teams. If a dog of war is lost in combat, he or she is honored by the entire squad. Feeding dishes are symbolically placed upside down and a poem called Guardians of the Night is read in their honor. 10. Until November 2000, military dogs were euthanized or abandoned after retirement. Before this time service dogs were considered “military surplus equipment” and deemed unfit to adjust to civilian life. These heroes were thrown away or put down instead of honored. President Clinton passed “Robby’s Law” in 2000 which allows handlers and their families first dibs at adopting military animals at the end of their useful service. The dogs are next offered to law enforcement, then adoptive families. Organizations like Saveavet.org place these retired heroes with suitable families and ensure they are given the honorable discharge they deserve. There are currently long waiting lists of civilians who want to give these veterans a loving home in which to retire.